Representing selected New Zealand and overseas blues and roots musicians. An invitation to tour Japan in 2014 saw Mike and Neil make their first international tour as a duo, performing acoustic blues and also working with local backing bands. This success led to a second tour in 2015, visiting six major Japanese cities, again with a mixture of acoustic duo and band work with Tokyo group ZZ’Z, some of the city’s finest. They appeared and performed live-to-air on Tokyo's InterFM. In 2016 They performed at the ‘Live Magic’ festival in Tokyo, where Neil was invited to play with the lead act, slide-guitar legend Sonny Landreth. Neil made his fourth visit to Japan in 2017, where he played with some of their finest blues and jazz musicians, such as former Chicago-based guitarist Shun Kikuta, boogie pianist Rei "Ms Lee" Kanehira, and acoustic guitar virtuoso Yuji Hamaguchi. Neil was invited by the Hohner company, the world's leading harmonica manufacturer, to be a guest performer at the company's Tokyo festival earler in 2018, where he demonstrated his skills on both the blues harp and the chromatic harmonica - a rare accolade. 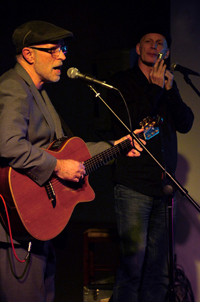 As an acoustic duo, the show features post war blues classics, some original songs and a jazz cover or two from Neil. All played with finesse coming from a wealth of experience in blues genres.